Highly personalized and refreshingly intimate, Luxe’s Specialist Hair Treatments have been conceived to help you look good and feel fantastic. Our treatments are never rushed, and our highly trained professionals will tailor to your needs and interests. Ultimately our mission is simple…to help your inner beauty shine through. The keratin contained inside keratin Miracle has two functions: it penetrates inside the hair, restructuring in-depth and at the same time compacting the cuticle’s external structure. Together with Dog rose, rich in vitamin C, which is used as a fortifier, they are able to reconstruct the structure of heavily damaged hair. The results of the treatment carried out with Keratin Miracle last up to 6-8 washed and increase if frequent reapplications are carried out, in that the gaps in keratinous structure are filled. Cleanse: This deep-condition treatment begins with a relaxing cleansing using Nourishing moisture remedy shampoo. Rebuild: Next, the vegetarian Miracle conditioning mask is applied. Containing a rich blend of avocado Oil, rice protein and seaweed extracts, thirsty hair is left reconstructed and hydrated. This service is a must have for all those who suffered through product build-up, dandruff and other common scalp conditions and who are tired of using harsh synthetic, medicated remedies. Detox: This purifying gel complex of zinc pyrithione and hydroxyl, salicylic and glycolic acids exfoliate the scalp of all product build-up, dry skin and environmental debris instantly and prevents reoccurring scalp problems. Cleanse: with the purifying shampoo. The scalp is stimulated with the detoxifying infusion of antimicrobtic agent selenium sulphite and natural disinfectant extract of pine and sage oils. Rebuild: The Vegetarian Miracle conditioning mask is then applied to nourish and restore the hair. Recommended for severely damaged hair, this intense treatment cleanses and rebuilds the hair using the Nourishing Moisture Remedy shampoo followed with the Keratin Miracle treatment and then finished with Vegetarian Miracle Conditioner. Formulated with enzymes, Vitamins, Minerals and Silk Proteins, extremely dry hair is immediately strengthened and restored to its natural health and beauty. Experience this energizing treatment that stimulate both the scalp and the mind. Cleanse: begins with a deep cleansing using energizing shampoo. Nourish: Following a rinse with cool water, an application of the De Stress Crème Yogurt Conditioner is applied. Full of essential minerals and plant extracts, this creamy and lightweight blend of active yogurt cultures moisturises and protects without weighing down even the finest hair. Treat: after another rinse with cool water the vitamins activist lotion is massaged into the scalp. This blend of essential oils is specifically designed to both clarify the hair follicle and stimulate the microcirculation to the scalp. Support: the service is completed with vitamin activist gel for added conditioning and volumising results. Experience the revolutionary Fusio-dose treatment designed to give clients an immediate hair transformation with visible and long-lasting results. With concentrates designed to meet your primary needs of coloured and dull hair, dry hair, damaged hair and fine and thinning hair, the Fusio Dose is the answer to all hair concerns. Olaplex is the original, unique and patented chemistry that multiplies bonds and cross-links broken bonds. The treatment gives colourists confidence, the insurance and the ability to colour or lighten hair at any level without the risk of breakage. 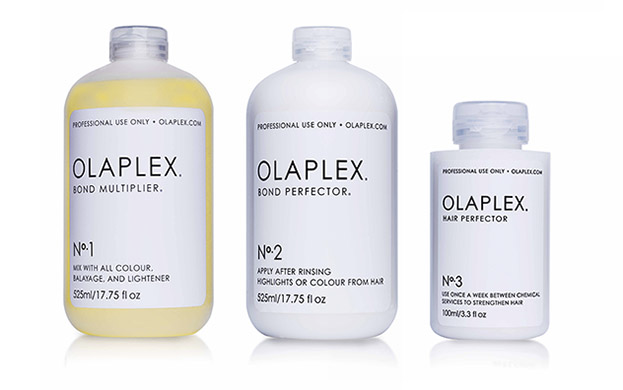 Olplex can be used in your colour services, or as a standalone-treatment, with its single acting ingredient repairing the hair from within.